Last week saw a consequential change in leadership at the Council on American-Islamic Relations (CAIR). But last week, news came that Salem is now out, replaced by Iyad Alnachef, a man with his own prior history of Islamist activism. 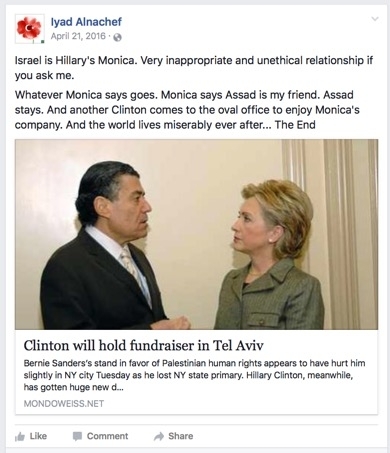 Alnachef formerly served as National Youth Director for the Islamic Society of North America (ISNA,) an organization named as an unindicted co-conspirator in the Holy Land Foundation terror finance trial and as one of "our organizations and the organizations of our friends" in an internal Muslim Brotherhood memorandum. Asking that Muslims love America and hate terror is "too high expectations Mr. President"? 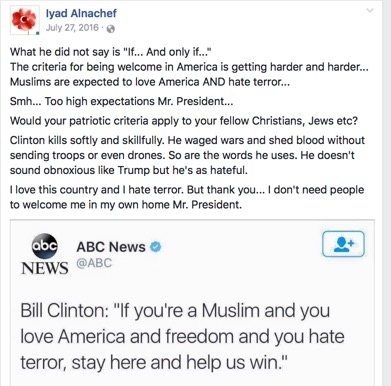 Clinton is "as hateful" about Muslims as Trump? 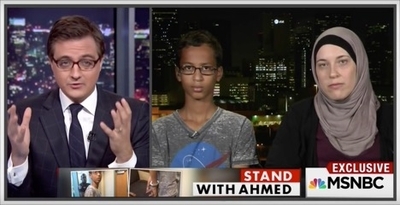 Alnachef seems to have a penchant toward fringe thinking; he shared a video in July 2016 promoting the idea that the Boston bombing was a "false flag." Here's an idea for CAIR to consider in its hiring practices: maybe it's because you keep picking people with extreme, out-of-the-mainstream views for leadership positions that 88% of American Muslims say your organization does not best represent their interests.